In 2013, we blogged about smartphone and tablet usage in the United States by age and gender. In those five years, a lot has changed: A mobile-first focus for websites, better information access, new social media apps, enhanced online shopping and more. Here’s an updated look at the current landscape of mobile device ownership and usage, especially among older adults. With these new device advances as well as changes in population, behaviors for smartphones and tablets have changed, too. According to a 2017 U.S. Census report, more than 15% of our population is now 65 or older, an increase from 13.9% in 2013. In the U.S., 46% of those ages 65+ and 75% of those ages 50-64 own a smartphone, says the 2018 Pew Mobile Fact Sheet. 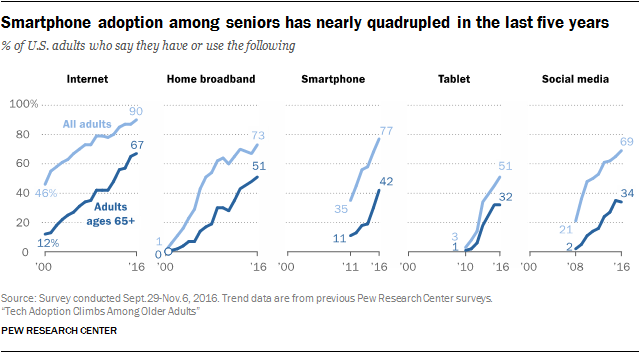 To put that in perspective, research shows that smartphone adoption among seniors nearly quadrupled between 2012 and 2017. 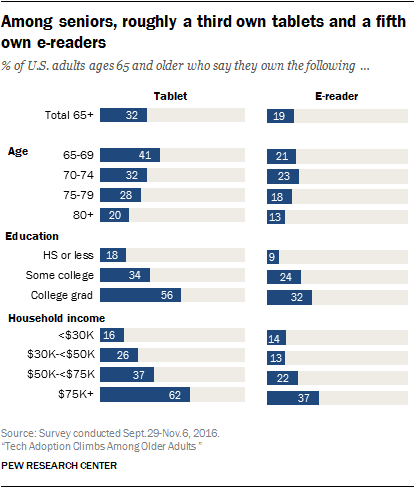 Tablet ownership has also increased by double digits over the last five years: 32% of seniors report using tablets compared to 18% in 2013, says Pew. The seniors most likely to use a tablet? Those who are younger (65-69), well educated and have a relatively high household income. More than 67% of seniors use the Internet, although of third of those 65+ still say they never go online. Curious what older adults do online? Our latest infographic shows what older adults do online — and how you can reach them. More seniors are social networking than ever before, with Facebook and YouTube their platforms of choice. Creating Results’ Sr. Client Services Director Beth Mickey reported on social media use by age in a blog last month. Marketing Implications: What Does It Mean for You? With an overall increase in smartphones and tablet ownership, as well as internet usage, it’s now more important than ever to have a mobile-friendly website. We recommend our clients use a responsive design, which enables pages to adapt to the resolution of the user’s device. To assess your site’s mobile speed and usability, try Google’s free Test My Site tool. Second, adapt your marketing campaigns to utilize digital and social platforms. A balanced integrated marketing plan can optimize your inquiries and leads across channels and tactics. Finally, for more mature consumer marketing tips, sign up for our email.